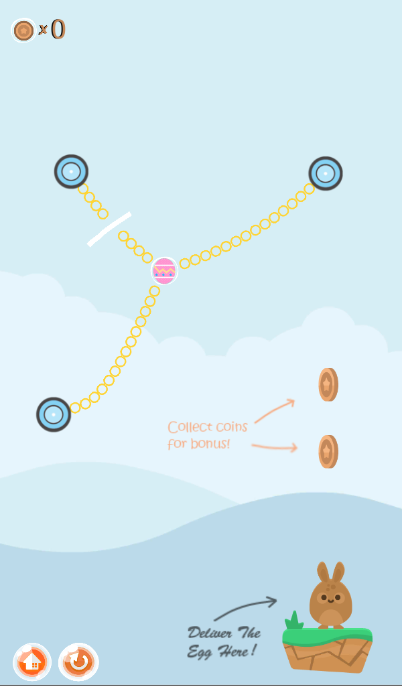 2D Rope Cutter Game is a complete ready-to-use unity game project which is mobile friendly and compatible with mobile, web and desktop. 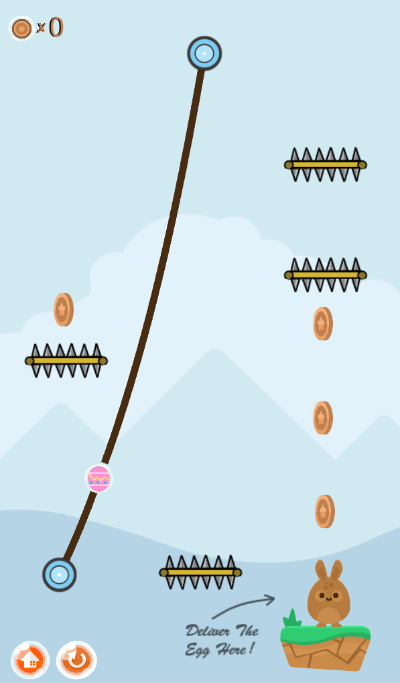 Perfect for creating a game like Cut The Rope or physic-based rope cutting Games. Clean and very simple, also easy to use and to understand. 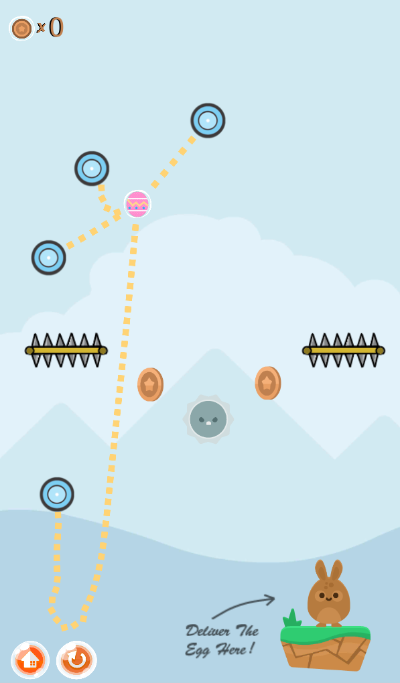 PLEASE NOTE: This is a UNITY game template that works both for 5.6.0 and 2018.X to create, learn and expand into your own ‘cut the rope’ type mobile and android game. Some features may be not what you are looking for, but all you see in the package is all you get. Please try out the DEMO URL before purchase. 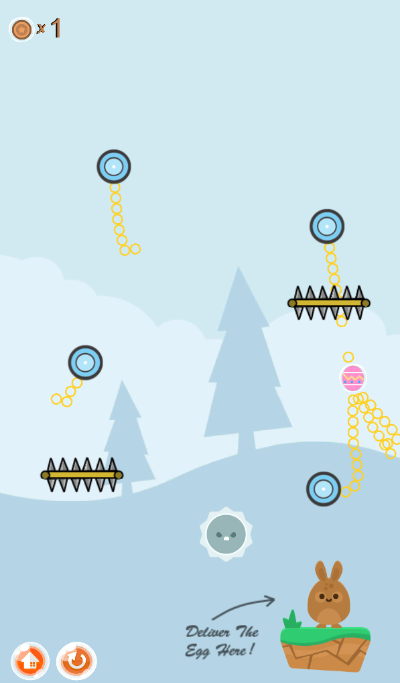 This KIT have everything you need to create a rope cutter game and you can create levels easily in less then minutes and have your mobile game published in no time! 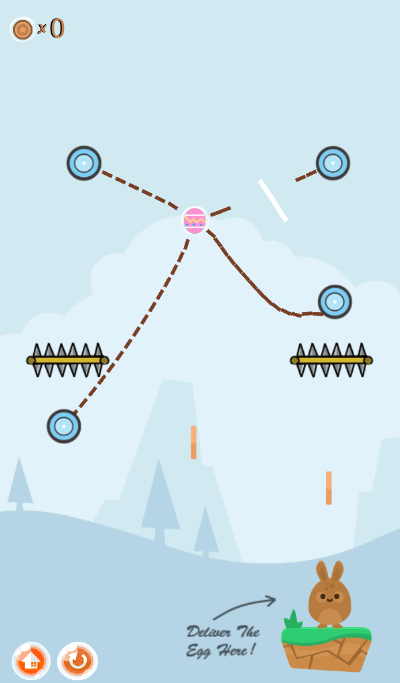 This project includes a fully function rope/chains/strings cutting feature where the player can cut the links attached with the target to bring it to the bunny to win the game and advance to next levels. 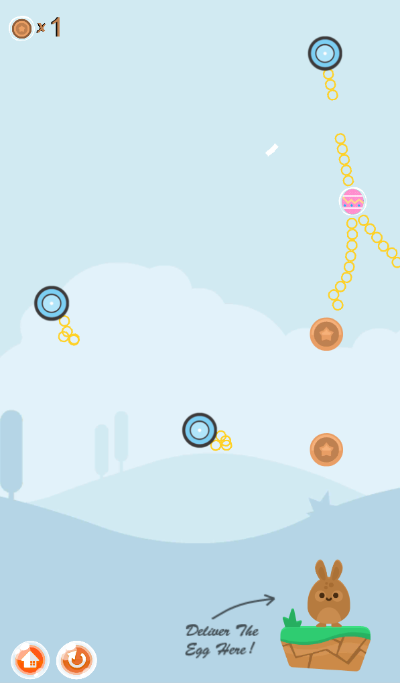 Including a score system to pick up and display score at the end, physics based puzzles, onscreen buttons which are easily customizable, cutting ropes feature, spikes and enemies that kills the target, coins to pick up, beautiful screen fadeout, trial following mouse feature, customizeable hooks with timers, customizeable normal hooks, customizeable ropes (chains, rope, strings etc.) and a amazing lasting experience including many more features. 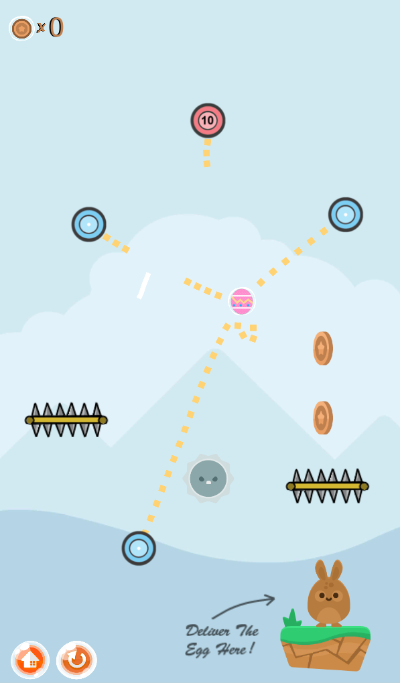 - A completed game project with sound, music, effects, gameplay, over 10 scenes, menu, full animations, sprites and more. - No programming skills required to start. - Ready for release and 100% mega easy to reskin. 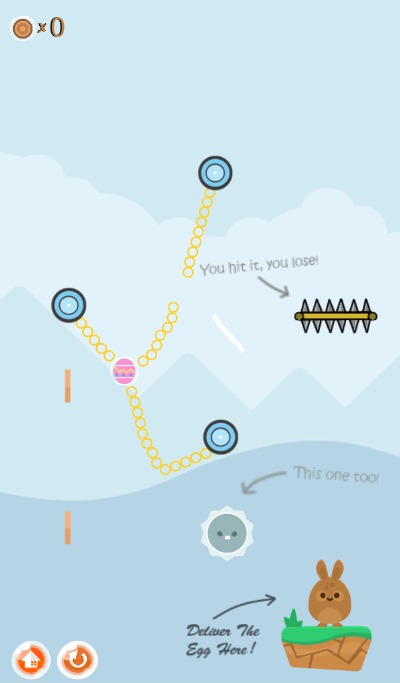 - Easy 2D physics to hook lines with colliders and rigidbody. 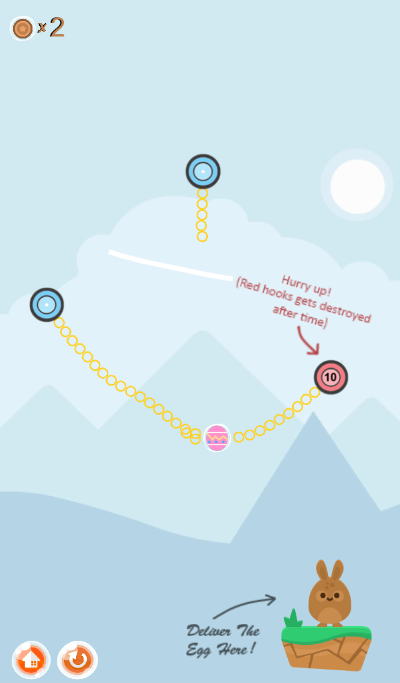 - Ready to use hooks with ropes prefabs to just drag and drop, all you have to do is drag and drop the hooks into the scene and they will automatically be attached with the target and you can just start cutting! 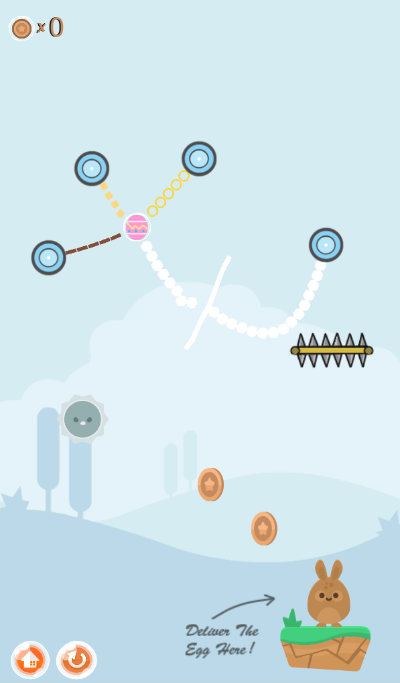 - Spikes and enemies, both animated and not that will kill your target if you touch with them and the game will end. - Beautiful trial following mouse feature so when you press the mouse button or tap your finger on the screen, a trial will follow your mouse/finger. - Fully scripted target which will be attached to the ropes in the scene automatically, Its never been easier! - Advanced functional cutter feature where you can cut the links (chains, rope, strings etc.) off the hooks and many more along with many customizable rope type, colors and more. - 10 example scenes included for mobile and desktop. - Score system where you can pick up score and display score at the end of each scene. - Easy to customize on screen GUIs with home and restart buttons. - Full ready to use complete game with menu, game over screen, win game screen, score system and more! - Over 20+ prefabs ready to use in your game, just drag and drop. - Over 45+ sprites to use in your game such as backgrounds, grounds, bunnies, target types, ropes, hooks and more! - Over 15+ music, sound effects and audios to use in your game. - Fully function beautiful fadeout feature to start your game. - Fully ready to use menu which can be customized very easily. - Customizable cursor script with 2 different cursors included. - Fully function smooth game over and game win feature with screen GUI which displays score at the end. - Customizable player sounds such as score pickup, die sound, win sound and more along with other customization. If you are looking to create a rope cutter type of game or anything similar, then this is the ultimate KIT for you which includes all ready to use sprites and prefabs to start your own game easy so you can just build and go and you can also change it with your own sprites. Detailed full documentation is included which covers everything on how to create your own game, along with many other things with also 10 example scenes included (including the menu).